Home>Intellectual Infrastructure, Meet Our Staff, Staff>Madan Bhasin, Ph.D.
Bhasin joined MATRIC in 2009 as Chief Scientific Advisor and is responsible for planning and guidance of research projects and international business development. He also serves as a resource and mentor for both senior and junior staff at MATRIC.Bhasin has over 45 years of experience in the chemical industry, primarily with Union Carbide and Dow Chemical. His primary area of expertise is heterogeneous catalysis, with a strong emphasis on surface science and the analytical techniques involved in catalyst characterization. He participated in the discovery, development, and commercialization of eleven generations of improved high efficiency ethylene epoxidation catalysts that have contributed to Union Carbide’s and Dow’s technology leadership position in this area. 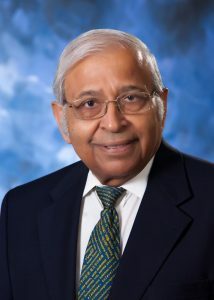 Dr. Bhasin was elected to the National Academy of Engineering in 2006. Bhasin joined MATRIC in 2009 as Chief Scientific Advisor and is responsible for planning and guidance of research projects and international business development. He also serves as a resource and mentor for both senior and junior staff at MATRIC. Bhasin has over 45 years of experience in the chemical industry, primarily with Union Carbide and Dow Chemical. His primary area of expertise is heterogeneous catalysis, with a strong emphasis on surface science and the analytical techniques involved in catalyst characterization. He participated in the discovery, development, and commercialization of eleven generations of improved high efficiency ethylene epoxidation catalysts that have contributed to Union Carbide’s and Dow’s technology leadership position in this area.